Portsmouth’s Spinnaker Tower and historic waterfront. Languages and European Studies, International Relations and European Studies have been taught at the University of Portsmouth since the early 1990s and have built a strong basis of teaching and research. The history, institutions, policy and law of the European Union are studied alongside the history and politics of key member-states such as Germany, France, or Spain. Students come from all over Europe and beyond, creating a truly European learning environment where languages and cultures interact and inform each other. Graduates have moved on to fulfilling careers at home and abroad. The University of Portsmouth is the largest centre for European Studies in the country. 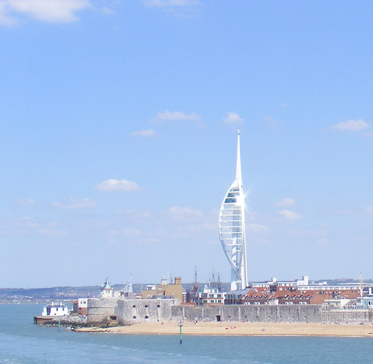 In the 2008 UK Research Assessment Exercise, Portsmouth was rated top for research in European Studies (Research Power Index). For this reason, the postgraduate European Studies courses are able to draw on a wide range of research expertise and to offer a very varied programme of units and approaches to the study of Europe. For more information about our courses, please see the University of Portsmouth website. Or you may like to find out more about the people in the European Studies team.